Summary: According to a Barlow Research Associates Flash Panel, small business customers appreciate it when their bank proactively offers solutions. How to best do that as customer needs change. HubSpot research finds 96% of companies that have 101 or more new opportunities in their sales pipeline each month achieve their quota vs. 85% for those with 51 to 100 opportunities and a dismal 18% for those with less than 50. 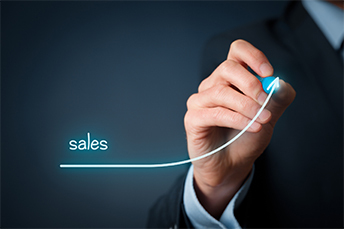 Clearly, it seems there is a link between sales opportunities in the pipeline and achieving sales quotas. Now you know. Speaking of sales, bankers should note that despite the issues at Wells Fargo as of late, cross-selling doesn't have to be a bad word. In fact, small business owners want their bank to cross-sell, according to a Barlow Research Associates Flash Panel. The firm's survey found that the vast majority of respondents actually appreciate it when their bank proactively offers solutions. Indeed, 86% said that they would feel even more confident in the ability of their bank to meet their needs, if their relationship manager takes the time to truly understand how their business could be best served -- and then recommends the right products and services at the time they are most needed. Meanwhile, a hefty 75% of respondents say they would actually buy more bank products and services, if the solutions were recommended at that time. Virtually all of the respondents say their bank should know the specifics of what they need, but only 39% say their bank is superior at this. Now, we know that community bankers are masters at knowing their customers. However, timing is everything. So, make sure you ask different questions and dig a little deeper at times. Small business owners particularly like it when their bank actively monitors their account for atypical activity resulting in unexpected fees, and then recommends solutions to better manage the account. Respondents felt this made the relationship stronger and gave them confidence in knowing that their bank was helping them when they needed it. Cross-selling the right way can also lead to more referrals. One respondent stated that if a bank is proactive in helping them find solutions, they would do all their business there and refer others as well. A referral program could help reward your customers for this type of high-level compliment. However, the point is not that you need the referral program for referrals, but that you are thanking your loyal customers for their trust in referring friends and family to your bank. So how can banks make sure they are cross-selling the right way? Start with those customers that have just a few services and try to fill one more need. Regular discussions with your customer facing teams will help identify the best product or service opportunities for each customer. Then, once you have a good idea of the direction of a given business, you can set up tailored communication campaigns. These can be boosted by using advanced analytics to flag when particular solutions would be most useful. Teams could also be armed with analytical tools that immediately generate custom sales documents, automatic follow-up emails, or referral forms. If done the right way, cross-selling doesn't have to turn off small business customers. Indeed, if you look and listen for not only what they need, but also when they need it, customers will be happy to give you a larger share of their business, greater loyalty and enthusiastic referrals. Good luck out there as you work to build your pipeline of customer opportunities and continue to help small business owners in your community. Mercator Advisory research finds 64% of US consumers use mobile devices to perform banking activities vs. 53% in 2016. However, the research also found more consumers access mobile banking from a web browser through the bank's website than through a mobile banking app. Bank of America's top technology officer, Cathy Bessant, said the use of bitcoin and other cryptocurrencies as a payments system is "troubling." She chose the word because she said that as a payment system, cryptocurrencies lack the foundational element of transparency between senders and receivers. Goldman Sachs projects only a 5% chance of a recession in the US in the next 12 months and less than a 20% chance in the next 2Ys, as consumer confidence sits at a 20Y high and capital expenditures are healthy. Bank of America believes in a cashless world, according to its Head of Digital Banking, Michelle Moore. She told Jim Cramer of Mad Money that the key to the bank's progress in this area is driven by listening to what customers want and investing $1B on digital banking in the last 6Ys. She said the bank had 1.4B mobile logins in Q1 of this year alone, with 33mm digital customers and 21mm mobile app users. Community banking teams can automatically send international wires using existing domestic platforms. Learn more by contacting us today.